Mum Natalia Price-Cabrera is the creative force behind the fab Mols & Tati-Lois. She reveals how she turned her passion and talent for designing and making items for her own home into a growing business. My mother is Argentinian and fairly flamboyant and we travelled a lot as a family when I was younger, so I think I have had a lot of disparate influences creatively as a result of this. I went to Sevenoaks School in Kent and then went on to do a Foundation Course in Art & Design at Brighton. From here I went to John Moore’s in Liverpool to study Textiles and Fashion, and after that I went to UCL to study History of Art and Spanish. While I was studying I also secured work experience at Christie’s and The Wallace Collection in London, and had a paid job at the weekends at The National Portrait Gallery. After finishing university I got my first ‘real’ job in visual arts book publishing and worked at RotoVision in Brighton for five years, working my way up the editorial ladder until I was running the whole department. From there I was a member of the start-up team for AVA Publishing (now part of Bloomsbury), where I worked for seven years, conceiving and developing the publishing list. The books I have worked on in my publishing career have all been highly visual, illustrated, non-fiction titles on subject areas such as graphic design, photography, interiors, fashion, illustration, advertising, architecture, digital design, popular culture, and filmmaking. After I left AVA I took a couple of years out to spend time with my young daughter before she started school and I retrained as a personal fitness instructor. I was all set to pursue this change in career when I was offered an extremely good job opportunity in Lewes at Ilex Press, and seduced back into the world of book publishing. I have been working at Ilex Press for the last four years and was the Managing Editor until the end of February this year when I went down to just two days a week in order to spend more time developing Mols & Tati-Lois. I am divorced and live with my partner Chris and two children – nine-year-old Tatiana and three-year-old Georgia-Mae – in a four-bedroomed house in East Sussex. How important is being creative in your work to you? Without sounding too pompous, I’d say it is imperative. Being creative and working creatively is just an extension of me. I guess I am fairly creative in everything I do, but I do think I would wilt considerably if I were placed in an environment where there was no creativity at all. How did your career change once you became a mum? It was a weird period when I became a mum the first time around. I’d been with my husband for seven years and things weren’t great – I felt fairly squashed in all sorts of ways, not least creatively. So I channeled myself into my career and went back to work after six months. I was part of a very exciting start-up publishing company and it was still in its nascent stages when I became pregnant. I did reduce my days to four days instead of five, but I was effectively doing a five-day job in four days. It all took its strain though, and I left my husband when my daughter, Tatiana, was just two. Then I had a horrific couple of years during which my dad died very suddenly and my business partner shafted me big time. I decided that for my own sanity I would take some time out and spend it with Tatiana before she started school. It was a tough yet incredible two-year period. So in a way, it’s difficult for me to explain how my career needs changed when I became a Mum as my whole life effectively got turned upside down. However, I was extremely lucky to fall back into publishing in 2010, which is where I met my partner Chris who is a photographer, writer and editor. We have another daughter, Georgia-Mae, and this time around I can explain how my career changed when I became a mum the second time. Being in a loving relationship made all the difference, however it’s still incredibly difficult. I am also extremely driven and I think I suffer (or rather suffered) from that age-old thing when you are working in a male-dominated industry – the need to show that you can do it all even though you are a woman and have children. So for me until recently I was trying to work harder as a mum, not necessarily smarter. How long have you been a ‘maker’? I have been making things since I was a child and have been obsessed with living spaces and making them ‘mine’ for as long as I can remember. I also went to art college. It all became real for me when I spent what was a small fortune at the time on a Nicolette Brunklaus’ ‘Hidden Royalty’ lamp stand in black for my home and married it with a coffee table I found at the tip for free and then revamped. I am extremely passionate about all things interior-related. Colour and pattern are my strengths I think, and I seem to have a good eye for both. I am also excellent at juxtaposing old and new – I get a thrill out of finding a sad-looking old piece of furniture and breathing new life back into it. I am at my happiest rummaging in second-hand stores, markets, boot sales etc, picking up vintage pieces of fabric, bric-a-brac, lampshade frames, and all manner of goodies that can be used in future projects. And I am not ashamed to say I like hanging out at the tip too to see what I can get for free! I love pretty much everything about the process of making, regardless of what it is. I get a buzz from creating a mood board, finding something that will trigger an idea and then running with it, bringing together different colours and patterns, sourcing the right fabric, paint, etc – and creating unique pieces for a room, be that furniture, lampshades or soft furnishings. Then the part where all the magic happens – dressing and styling the space, and adding lighting (which I consider to be hugely important – to quote Jonathan Adler, “Lighting is the unsung hero of design.”). This inherent need to make and create has never gone away, but a full-time job and children did put things on hold for a while. At the beginning of last year Chris bought me a 1939 Singer sewing machine and I took myself off on a course to learn how to use it. I was completely hooked and started making cushions, patchwork quilts, and things for the kids with gusto. What inspired your current career as a lampshade maker? We had recently moved into our new house and I was after a very specific lampshade for one of the rooms. I found a few I loved made by Squint and Beau Vamp, but they were way out of my budget so I decided to learn how to make one myself. I found an old shade at the tip, stripped it and then bought every book I could find (mostly from the 1950s and 1960s), looked online and did a course in London. I was hooked! I absolutely thrive on the architectural nature of lampshade making. I love it so much that I now base my small business around lampshade-making (predominantly hand-tailored soft-sided shades), furniture painting and furniture re-upholstery. Carefully. I make a point of being very realistic about what I can and cannot achieve in any given time as I have a tendency to think I am superwoman and can do everything yesterday. I try and balance making new products with self-promotion and following up new leads. It keeps coming back to networking actually. I find the more I network the more avenues appear and I get to meet some fairly fantastic people along the way. How important is social media to you, and how do you use it? It couldn’t be more important to be honest. I post daily on my Facebook site about what I am up to and what is inspiring me. I have gone from no likes in April 2013 to over 8,500 in April 2014, which I think is pretty good going just for little old me! I try not to do the hard sell, but I have generated a lot of commissions through Facebook. It’s also a great way of following what is going on around you in the creative industries and I love the whole cross-pollination vibe that this generates. It’s an incredible source of inspiration. I am also totally hooked on Pinterest and here again I get loads of ideas. I also use Twitter, but if I am honest I am not a great fan. I don’t find it as personal. Where do you sell your lampshades? I sell through Folksy, Etsy, Bespokee and my Facebook page. I also do a lot of craft fairs around the country. I did have my lampshades in a local emporium for a while, which generated quite a few commissions, but the cost of the floor space was hefty so I am investigating other alternatives at the moment. To be honest a lot of sales come through word of mouth. Selling online is a no brainer in that you have so little in terms of overheads. At the moment I am juggling kids/home life, working two days in the office, and the rest of the time making lampshades etc, and doing freelance editorial work too. I’ve realised the hard way that there has to be balance and I have to manage my time carefully otherwise I burn out and I am no good to anyone. Up until the beginning of March this year I was working four days a week in publishing doing a five-day job, managing a department and list of books plus being a mum and running Mols & Tati-Lois. My health suffered so did my sanity so I took a step back and reassessed what I wanted out of life and what was really important. At 43 I don’t feel the need to be top of my game in the publishing world. I’ve been there for quite a while now. It was a bit of an epiphany to realise that it was okay to let go of stuff! Also Chris (my partner) was hugely supportive and told me everything would be okay. His belief in me and what I am doing continues to be a driving force behind the direction my life is now taking. So I reduced my days to two, which gives me one day hanging out with Georgia-Mae until she starts school, and two days working on Mols & Tati-Lois. It also means I can do more ferrying around for the kids and I get to socialise with other mums and I have time to arrange play dates etc. It also allows me time to do ‘me’ stuff, which I think is so important as a mum otherwise you are always putting everyone and everything else first. I love cycling and often ride to Lewes to work. I also enjoy running, yoga, Pilates and generally keeping fit and active. My major luxury in life is a cleaner, the brilliant Max! Thankfully Chris is also freelance and he is very hands-on with the kids and domestic chores so we work as a team. Without this I don’t think a lot of what I am trying to do would be possible or sustainable. Oh and my kids are pretty cool too and love what I am doing so they just let me get on with it! Tough question! I spend a lot of time reading magazines, reading blogs and generally keeping my eyes open to what is going on visually around me. I’ve kept scrapbooks since I was little, and I stick magazine cuttings in them, postcards, flyers, all sorts of things. I flick through these on a regular basis, but I get inspiration from just about everywhere – films I watch, places I visit, other people’s work, magazines, books, online, conversations with people, galleries/exhibitions. I am quite good at thinking laterally too, so sometimes inspiration comes from the most unlikely places. My partner definitely inspires me. He’s a photographer so he constantly draws my attention to things I might not look at. He’s also a lot more logical than I am and can work out a solution to something that I am trying to create. My kids are great too. They make me see connections between things that I wouldn’t necessarily see otherwise. Like when they dress themselves and put on the most outlandish outfits that somehow work. I also spend a lot of time looking at things through their eyes, particularly the youngest who is really into everything, what it is, how it works, what it means etc. And my family in general inspires me. I have three sisters and they all have kids and when we get together as a family it is very Mediterranean with everyone talking at once about different things. I love all that though. My oldest sister used to be a fashion designer and has always been very creative. I really looked up to here when we were younger and still admire her hugely. She has an innate sense of style and makes it look effortless. She rocks! My mother is Argentinian and this informed a lot of my upbringing and I have family in Spain. Both my parents were marine botanists so we travelled quite a lot when I was younger. They were also fairly nomadic and we would go on vast long holidays in the campervan and explore places off the beaten track. As a result I was exposed to a great deal of culture. I was always a sponge so would soak up whatever was around me and then translate it somehow into what I was doing creatively. I’ve always loved colour, texture and pattern. I am really into tactile things and I love the almost ‘architectural’ challenge of a lot of crafting. I take pleasure from things that are beautiful and I thrive on detail. I’ve never considered myself as having a ‘style’ to be honest. I am just me and I throw stuff together because it makes sense in my head. A friend of mine described my ‘style’ as modern rococo with a heap of boho and granny chic thrown in. But then I am also a fan of the Tolix chair. I love lots of colour and pattern. Very eclectic. Mixing old and new. I think I definitely make livable spaces that have heaps of character and a degree of quirkiness. I also like lots of artwork around, photos, books, foliage, soft furnishings, textures, playing with scale, using light effectively and essentially making somewhere where you want to spend a lot of time. I totally agree with Le Corbusier when he said, “The home is the treasure chest of living.” What I make is very much a projection of myself. The world seen through my eyes! However, I do believe I can take onboard what others want and also different tastes, likes/dislikes. I guess I am very versatile and apply my style appropriately to different things. I listen to my gut. It’s a very visceral experience for me. I get inspiration from everywhere to be honest. If it doesn’t sound too pompous, I would say that there is a history to my style and a depth. I create interesting pieces/spaces that encourage conversation and questions. What are your ambitions for Mols & Tati-Lois? First and foremost I need to get a website up and running. I am not very technologically minded so I have been procrastinating about this a whole load! I also want to start a proper blog so I can expand on things I would usually just do a little post on Facebook about. Long-term projections are more glamorous. I would love to have a permanent physical space for Mols & Tati-Lois to showcase my lampshades, furniture and upholstery. However, I have always had a dream of having a space that doubles up as a gallery space for other people’s work too, so effectively it would be like a creative collective of home-grown talent. I plan to go to lots of graduate shows this year and see whether I can talent spot and start things up online initially. We shall see. 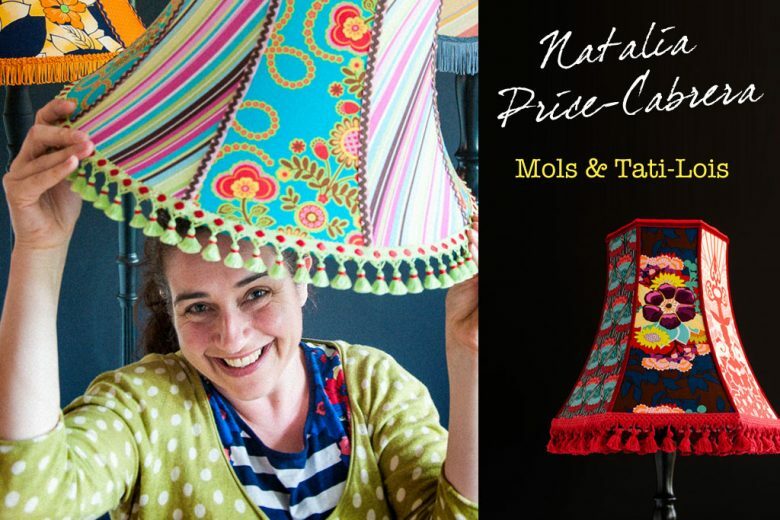 Bottom line: I would love Mols & Tati-Lois to become synonymous with exquisite contemporary lampshade design – a boutique purveyor of simply stunning hand-tailored soft-sided lampshades! Single bloody mindedness! No in all seriousness, I think you have to be completely passionate about what you are doing as a hobby otherwise it will never translate into a business. Unless you have the passion and commitment I don’t think you’ll ride the storms that will inevitably come along with (hopefully) all the good stuff. You also have to have an enormous amount of self-belief or at least have people around you who believe in you. On a more practical level you need to do your research. Find out who else is doing what you want to do. If you can’t beat them join them. Networking is probably the most important thing I have learnt to do. The making/crafting world is an amazing community of very talented and interesting people. I don’t think I’ve met anyone yet who hasn’t been helpful and inclusive. It’s all about support and sharing, and it makes for an incredibly fertile creative ‘pot’. Tenacity and hard work also help. You do really have to put in the hours. Also a supportive family is a godsend. And finally – where does the name Mols & Tati-Lois come from?!! The name comes from my daughter’s name Tatiana Heloise and my niece’s Molly. They are both strong, original, clever, beautiful and fearless. Something I want Mols & Tati-Lois to be! You can keep up with Natalie’s latest news and creations on Mols & Tati-Lois’ Facebook page.